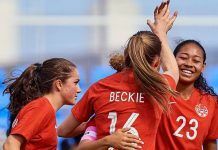 The 46th edition of the Festival International Espoirs Provence kicks off this weekend and Canada have their sights set on their opening Monday match against Portugal. Canada are one of 12 nations competing in the 2018 tournament with matches to be played from 26 May to 9 June in France. Throughout the competition, fans can follow the Canadian team across Canada Soccer’s digital channels including Twitter, Facebook and Instagram. Canada have a promising group of young players who will benefit from the international experience at the tournament in France. It’s an important opportunity for these players as they continue their development towards contributing to a successful Men’s National Team Program. Canada are looking ahead to the next Men’s National Team matches in 2018-19 Concacaf Nations League, and also to the next Concacaf Men’s Under-20 Championship which will serve as the qualification route for the FIFA U-20 World Cup Poland 2019. More than half the squad for this tournament in France are born 1999 or later and are thus eligible for those upcoming U-20 competitions. All players are also eligible for the next Olympic Qualifiers ahead of Tokyo 2020.